On the 7-11 of July, the 2014 Annual Ministerial Review was convened in New York as part of the ECOSOC High-level Segment, UN. On the first day, attendees heard a statement, prepared by President of the Russian MS Society (RuMSS) Dr. Yan Vlasov that suggests initiating under the auspices of the UN a discussion platform between NGOs in the ECOSOC consultative status from all over the world to discuss the RuMSS’ initiative of establishing public control in healthcare. 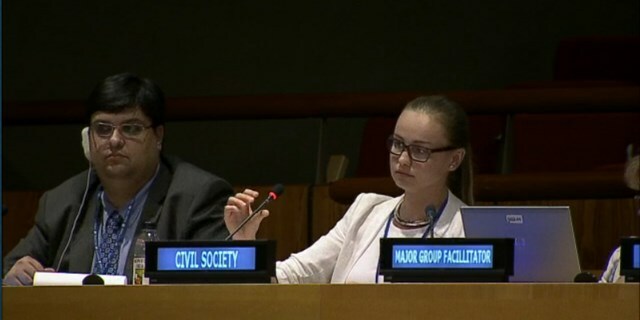 President of Russian Center New York Elena Branson and Center senior specialist Anna Balashova delivered the statement and initiative at the UN. Moreover, the text of the statement will be posted on the UN website. Four NGOs were given the floor, among which two Russian: the Public Chamber of Russian Federation and Russian MS Society, a French NGO and a British one. This is a unique opportunity for NGOs in the ECOSOC consultative status, such as RuMSS, to be heard in the most authoritative organization in the world, as well as make their own contribution to issues on the international stage. Moreover, before being heard in ECOSOC, UN, the statement, developed by Yan Vlasov, had been considered by the Ministry of Foreign Affairs, which provides great opportunities for our initiative to be implemented.